Home›Uncategorised›National Shire Horse Show report and photos – make sure you get the Summer issue of Heavy Horse World! 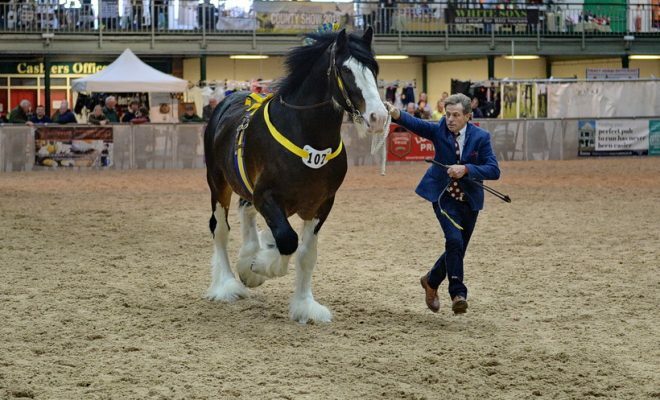 Reports and photos have been flooding in to the HHW office from the National Shire Horse Show which saw some great wins for the Bedford family, the Fountain family and a host of other top breeders and showpeople! The Summer issue will feature great images and lots of stories from this great showcase for the UK’s favourite heavy breed. Don’t miss it – so if you are due to renew, or want to ensure you get all the heavy horse news for the rest of the year take out a new subscription, at www.heavyhorseworld.co.uk – it’s just £30 for UK subscribers, a bit more for overseas. Enjoy this image of the 2019 National Champion Stallion, William Bedford’s Landcliffe Charlie, shown by Walt Bedford, and photographed by Kevin Wright.